ninaaneko: When you put fashion and culture together. When you put fashion and culture together. When Vogue revealed the Met Ball's theme this year as "China: Through the Looking Glass", I was skeptical. I imagined the red carpet filled with a westerner's stereotypical features of the cheongsam/qipao present on ballgowns or mandarin collars popping everywhere on tailored suits. It's the same agitating feeling I tried to ignore when I was younger and witnessed girls on the streets of Brunei combining pure kebaya tops with jeans. I guess deep down, I cringe at certain thoughts or ideas of putting together culture and fashion. Fashion can go far into the end of a spectrum for abstractness. I've always depicted fashion as a source of escapism and not necessarily from anything bleak, it's just that fashion editorials in magazines and haute couture do have a level of fantasy associated. No matter what fashion aesthetic the designer used to approach, be it an anti-fashion dress made of deconstruction or thought provoking wear that convey literal messages - at the end of the day, it's not a revolution and they didn't cure cancer. It's still a little fantasy turned into tangible fashion. On the other hand, the turn out of the Met Ball proved me wrong in different directions. There may have been a vast improvement in representing asian cultural fashion stereotypes but the ball didn't do enough justice in getting Chinese designers more fame time. In fact, in some cases - they were ridiculed and turned into the next biggest internet meme (I guess Rihanna will not be a returning client to Guo Pei any time soon or looking at eggs the same way). However, it is no doubt that certain expressive asian designers look deep into their roots and culture as a source of inspiration and influence. In the case that an asian designer does so is the only time the merge of fashion and culture appeals to me. Nobody does asian fashion better than asians. Okay, I may have enjoyed Chanel's 2016 cruise collection in Seoul but Lagerfeld is a different fangirl story and I just wanted to prove a point. So yesterday, Singapore turned 50 years old and Harpers Bazaar Singapore celebrated by posting a throwback series on instagram from 2008. 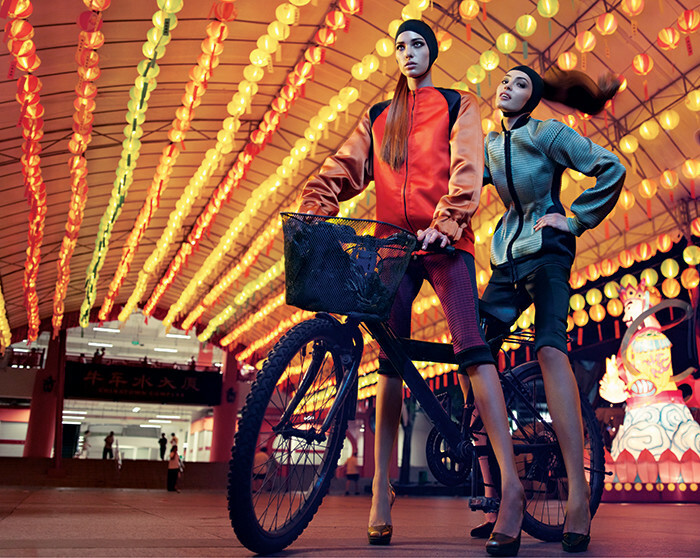 This showcased an iconic editorial based on a backdrop of local areas. I really enjoyed it and felt a relatable level with the ideas involved in the editorial. It's an exaggerated view that parallels with Singapore realness and the fashion culture. The lack of symmetry was interesting but thankfully, not too serious. One image displays two girls at Kopitiam drenched in Bottega Veneta and drinking teh peng and ice barley. Another were the girls in Burberry Prorsum casually chilling in an mrt. I like that they kept them layered as if the temperature had immensely dropped in Singapore, so this made it fit my take on the editorial at an obvious level. Have you ever layered yourself with a blazer or jacket just to make a fashion statement despite the hella hot climate in South East Asia? Yeah, well I'm guilty. All photos were taken from Harpers Bazaar Singapore.